When I found out I was pregnant with Little D I didn't have any preference whether I had a boy or a girl, the fact we were having a baby was good enough for me. Hands off the raisins, they're mine! However I come from a long line of girls so subconsciously I didn't really expect to have a boy, needless to say when he arrived he was somewhat of a surprise. I would be lying if I didn't tell you I had a quiet little period mourning not because he wasn't wanted or that because he was a boy, just that I thought girls clothes are nicer and that he probably wouldn't be interested in tea parties and baking. How wrong I was. Not only are boys toys much more interesting (fact), I quickly found if you shop around you can dress boys in a lovely way without them having to be dressed head to toe in forest green, burgundy and black. Plus this little one was happy to shop til he dropped, was a honorary 'lady who lunched' and as I discovered this weekend really enjoys baking too. I was surprised how interested he was and how much he was capable of doing. He already understood what scales were and supervised closely, he helped me crack eggs and whisk them, pour milk and count out raisins (one for the bowl, two for Little D). 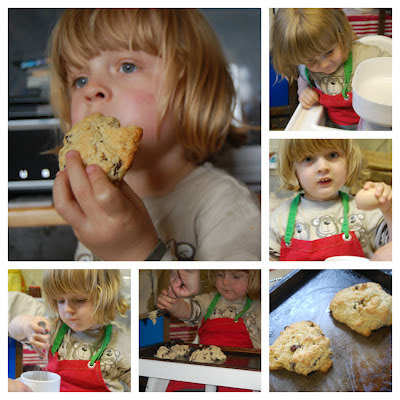 Of course he was excellent at hoovering up the finished rock buns at the end.